In Nick you type your username on SCC, in Password field any random password and in Email your email address registered on SCC. Make sure SSL is checked. If everything is done click on OK.
Now you log in SCC, go to torrents list and right click on the link for torrent downloading, then you choose 'Copy link'. Paste the resulting text into the "authkey" box, this should automatically extract your passkey. Make sure "Force HTTPS (SSL) downloads" is checked. 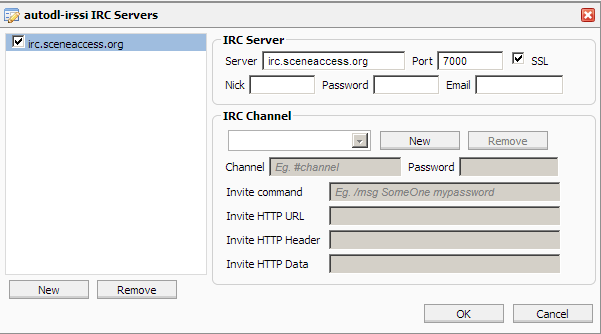 Now in your autodl-irssi log there will be info that you got connected with announce SCC channel. Now that you have the bot connected to the server in the announce channel, you need to configure filters to tell the bot what torrent files to grab.